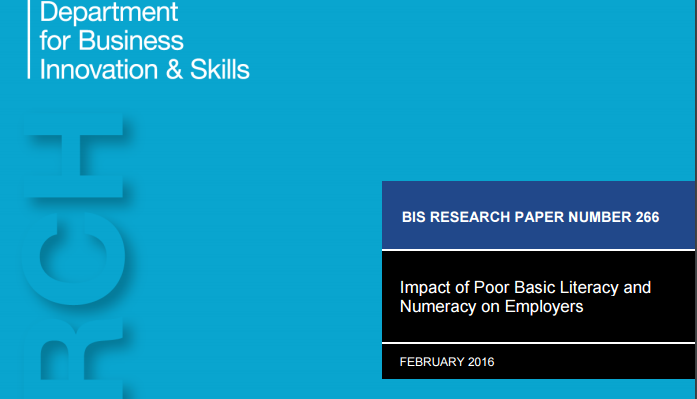 This report presents the findings of a study to estimate the economic impact of poor basic skills on workplace performance. It aims to address the lack of evidence on the prevalence of poor basic skills in the workplace and its impact, as well as the costs and benefits associated with public-funded basic skills training. Successive UK governments have focused on addressing basic skills deficit in the workforce in recognition of the economic and wider public benefits. However, much of the research evidence on the impact of basic skills interventions has focused on employees’ basic skills levels rather than on the impact of these skills on employers. There is little reliable evidence on the scale of costs resulting from basic skills deficits in the workplace. Where research has been undertaken in this field, it has focussed on the routes through which employers might incur costs rather than attempting to estimate them. The report provides evidence for the need for researchers, policy makers and others to focus their attention on the demand-side of skills. Where work processes are designed to compensate for, or mask, literacy and numeracy deficits among employees, this may contribute to skills decline and poor take up of training opportunities by reducing the demands on employees’ skills and their motivation to improve them.